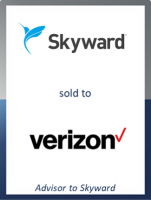 GCA's client Skyward, a leading drone operations management company, has been acquired by Verizon. Skyward, headquartered in Portland, Oregon, provides software that helps companies manage drone operations, improve safety and lower operating costs through a single source technology that integrates, manages and wirelessly connects drone operations. Verizon Communications Inc. (NYSE, Nasdaq: VZ), headquartered in New York City, has a diverse workforce of 160,900 and generated nearly $126 billion in 2016 revenues. Verizon operates America's most reliable wireless network, with 114.2 million retail connections nationwide. This transaction brings drone operations management to Verizon's Airborne LTE Operations (ALO) initiative, part of its broader IoT portfolio. With Skyward's technology, Verizon will streamline the management of drone operations through one platform designed to handle end-to-end activities such as mission planning, complex workflow, FAA compliance support, supplying information about restricted airspace and pilot credentialing, drone regulation and provisioning rate plans for drones on Verizon's network. GCA acted as exclusive financial advisor to Skyward in connection with this transaction.